Japan has a bicycle culture that the UK and US, among others, drool over. I love seeing the bikes and the cycle chic whenever I'm in Tokyo. So very cool and inspiring. The backbone of the bike culture are the young mothers of the nation. 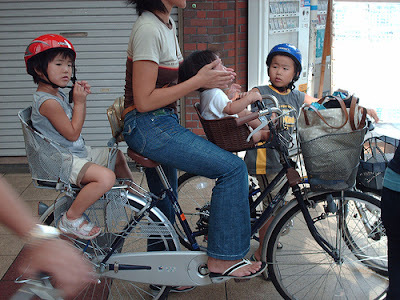 They practice the tradition of 'sannin-nori' - or three-on-a-bike - whenever they have to transport their kids. Most kindergartens in Japan ban mothers from dropping off their kids by car, so these sturdy 'mama-chariots' are an integral part of daily life. One kid up front, another on the back and the mum in the middle. It's a sight you see often in Copenhagen, but in Japan these mothers form a formidable army of toddler transport. When the Government's new cycling laws - a giant leap backwards by all accounts - banned the sannin-nori culture, the mothers of Japan got cross. Their initial protests were heard and it was quickly suggested that they could continue riding with two kids if they rode trikes. Not a bad idea, but the average 'mama-chariot' costs around £50. 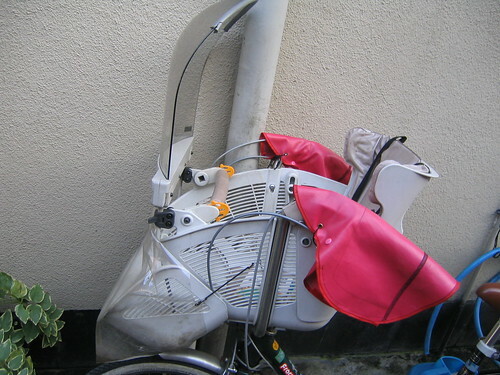 The cheapest trikes will set them back around £500. This isn't doable. These mothers possess the most powerful weapon imaginable: their wombs. In a country with a frightfully low birth rate, children are an even more valuable commodity for society than normal. The mothers have threatened to stop having a second child in protest of the new laws. That threat has struck a popular chord. This is bicycle culture protest at it's best.